Fabio Serra started developing his musical passion during early childhood. His family helped him a lot keeping the music as important part of their life. The first instrument Fabio was experimenting with was his grandfather's piano. At the age of 6, he discovered music of THE BEATLES. Fascinated with the group, he started playing the guitar. This instrument became his favorite and now he is using it almost exclusively. Between the age 13 and 20 he studied jazz and rock guitar. He also played with several local bands, becoming a fan of Progressive Rock and the group GENESIS. At that time this group influenced the style of music he played. Later on Fabio was also experimenting with other kind of music, from A.O.R. Jazz/Fusion to New Wave. 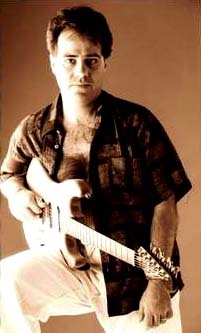 In 1986 he recorded his first studio work as a guitarist with the experimental band Konya Dance. Meanwhile he get involved with midi recordings and computers because his interest shifted more into the writing and producing, rather than just performing. In 1987 he started to collaborate with Ragtime Records studio in Verona, as arranger and musician. At that time he met there Johnny di Martino. During his work in Ragtime Studio, he has been contacted by Farina & Crivellente who asked him to join them to work in Factory Sound Studios. In the late 1989 he started working on many High Energy tracks for Alfa Records. After few months he actually joined Factory Sound Studios (followed by Johnny). That is how the ultimate Factory Team was born. The Factory Team's sound grew up during the years. Guys were working on different projects and were facing different styles. Their touch is now well known and is part of professional evolution during their tenure years in S.A.I.F.A.M. D.J. Miko - "What's up"
T.H. Express - "Missing in the Rain"
Amos - "Only Saw Today"
Purple Beat - "Don't Stop 'til You Get Enough/Time to Party Now"
Wildside - "In My Arms"
"better to be than to look"